Mr. Maverick has a plan. I guess that means we can all relax, and trust that this evil-looking dude will make sure that the city is safe. 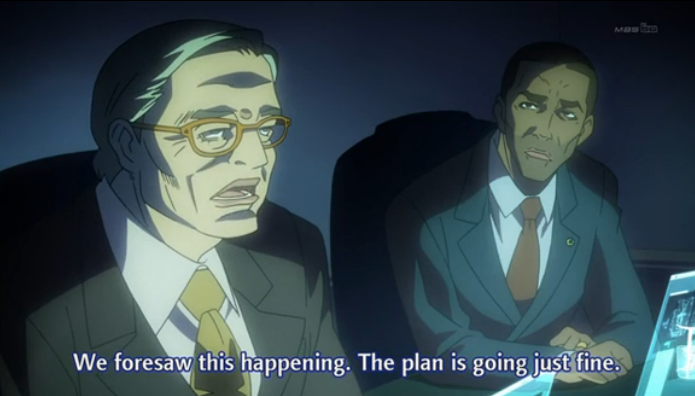 Tiger & Bunny episode 11 was clearly a build-up episode, with more tension, and less action than most. It had a couple of nice moments, such as Kotetsu’s attempt to cover up for Bunny’s temper tantrum, and Origami’s first opportunity to properly use his skill. But what really struck me was the role being played by Mr. Suspicious Maverick. Mr. Maverick sending Origami off to do the dangerous work. I had been suspicious of the company running the Hero TV broadcasts from the start. 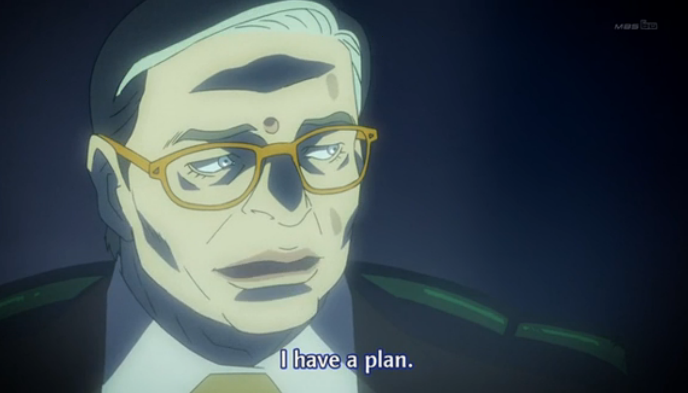 In the last episode, Mr. Maverick, the CEO, convinced the city officials to not call in the army, and leave the terrorist attack in the hands of the heroes. He also convinced Agnes to keep the live feed going, despite the potential for inciting panic in the citizenry. This time he convinces the mayor to release the criminal Next, Jake Martinez (a capitulation to the terrorist demands). Maverick is one of the few to know that Origami, in disguise, has infiltrated the terrorist headquarters, but Jake Martinez seems to know who Origami is. Despite telling the Mayor that he will take full responsibility, Maverick convinces Bunny (Barnaby) to reveal on TV that he has a grudge against Jake, who murdered his parents, thus setting the expectation in the public’s mind that Barnaby is the one who should be dealing with the problem. Yes, it looks like the city is under attack, and the situation is spinning out of control, but it is all going according to Mr. Maverick's plan. Now, maybe I’m wrong, but Maverick could easily be working with Ouroboros. Maybe he isn’t interested in assisting them, as much as it is sweeps week, and he hopes Hero TV will get a boost, because everyone is gripped by the drama being played out on his station. If he did alert Jake to Origami’s presence, he is even worse than that. Certainly the show hasn’t made this clear yet. Either Maverick is going to have to do something to redeem himself in my eyes, or I will give Lunatic the go ahead to torch him for his crimes against the city of Sternbildt. (Yes, I am that influential). Oh, yeah. And this guy needs to have more lines. 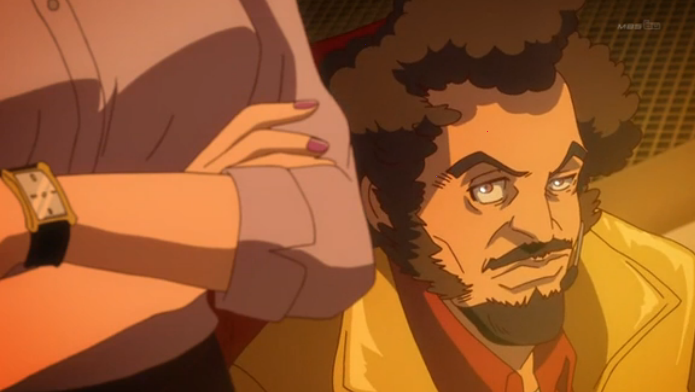 He is one of the coolest side characters of the season, if not of all 2011. I can’t help but wonder if Mr. Maverick raised Barnaby as his pet superhero for a moment like this, if not this particular moment. He’s certainly playing the arch enemies angle pretty hard in public, but there’s still the question of what he’s really after with all of this. Ratings and power seem like a given, but the big question is whether he has Ouroboros ties or is just an interested third party in the conflict. Agreed on afro man, anyone who can style his hair like that is always good in my book. Yeah, I don’t know what to think. 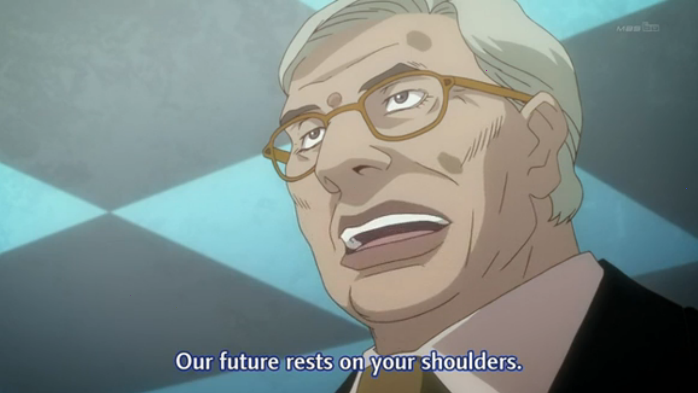 It seems he knew about Barnaby’s background all along, so that might mean he was planning something with Ouroboros from the start.